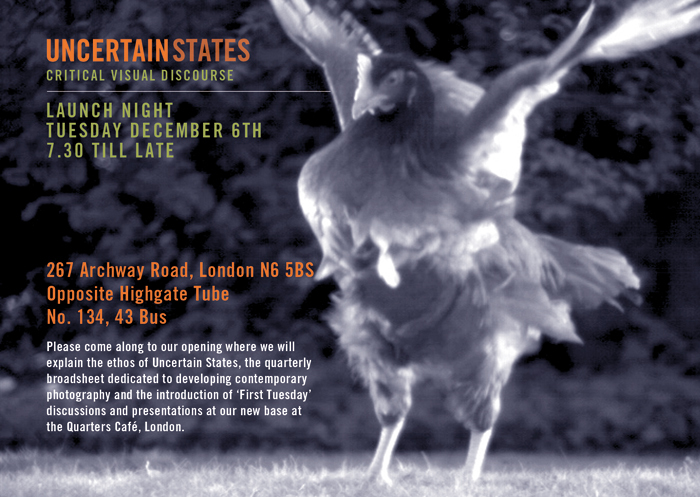 Tuesday 6th December will see the opening of a ‘Salon of Fine Art Photography’ organised by UncertainStates.com. There will be a exhibition of work by artists which will be on display throughout the year with new work being added and replaced regularly. Eventually there also be independent film nights and speakers organised around the venue. The opening is from 7.30pm on Tuesday 6th December at The Quarters Cafe 267 Archway Road close to Highgate tube station. Normal opening hours are currently 9.00 to 5.30pm. information about projects, commissions and other photographers work.